Not so much a book, or even a series of them, as four: The Farseer Trilogy, the Liveship Traders, The Tawny Man, and the Rain Wild Chronicles. How could I possibly choose? Robin Hobb's characterization is masterful - many novelists have the rather worn 'living and breathing characters' applied to their fiction, but few deserve it so much as Hobb. She takes flawed, realistic characters like FitzChivalry Farseer, takes us few their lives, shows their change, development, mistakes, failures - and despite this, her tales are still profoundly heroic despite - and perhaps because of this. The Liveship Traders trilogy also takes into account - and as its protagonists - that most neglected of fantasy castes: the merchants. In the Liveship Traders, characters really develop: those you start out hating (such as Malta, for me) can be those you're cheering for by the end, and really, without giving more away, what can I say but 'read them'? Also the best take on dragons I've ever read. and its successors are beautifully written, expertly crafted stories, at their heart, they're driven by a single, enigmatic character: Kvothe. From the first page, Kvothe's tragedy and mystery is revealed to the reader: 'the patient, cut-flower sound of a man who is waiting to die'. Kvothe, in the story of his life, is a genius - literally - and tells his tale in the tradition of a true storyteller: with inaccuracies and quirks included, as well as his customary wit. We, as readers, are immediately struck by the contrast between the past and present Kvothe: he's well written, enigmatic with none of the 'wise old mentor' baggage that fantasy has come to expect, and tragic. And we read on despite that inevitability, because Rothfuss is just that good. 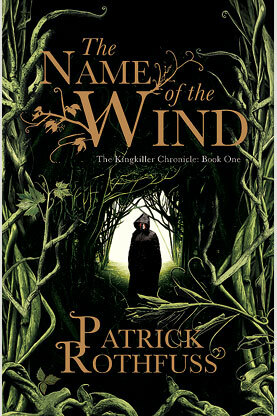 If you're interested in an actual (if brief) review of The Name of the Wind, you can find it on my list of essential fantasy reads: HERE. Tad Williams is an author who can really make the old-fashioned coming-of-age, Bildungsroman story work - almost as well as Rothfuss, though with fewer quirks. Memory, Sorrow, and Thorn also earned a place on my Essential Fantasy list, which you can find the link to above. Though it's been many years since I read the novels, Simon is an adolescent protagonist who might suffer from some almost fantastically common flaws, but Tad Williams makes him suffer the reasonable consequences: Simon might blunder, but he quickly learns the price, unlike many author's darlings in other fantasies. This is traditional fantasy at its best, and the historically-based setting only makes Williams' work more entertaining - though be warned, fans of magic: there's little human-controlled, rule-based magic to be found here. Read these books? Thought of something else I should have featured (or remembered to read :P)? Comment and tell me below. I like these picks, though I always found Simon just a bit flat. Binnabik more than makes up for it, however. In terms of great character-driven fantasy, I would have to put LeGuin's Earthsea books at the very peak of the list. Subtle, realistic, nuanced, and transformative. I totally agree about Ursula le Guin. Her characters are immortal and stories sublime. I would actually classify her work as philosophical-drama-thinly-veiled-as-fantasy. "A wizard of Earthsea" and "The Farthest Shore" are especially strong in terms of emergent characters. I found pretty much all of Hobb's characters to be unbearably whiny. I managed to get through Farseer and Tawny man trilogies, but no more. As for Earthsea, that's something I completely overlooked. I agree, 'A Wizard of Earthsea' definitely should make that list, although some of its sequels in the setting didn't do as much for me, although 'The Other Wind' was certainly a thematically nuanced read - much more so than many fantasies. Didn't enjoy Tehanu as much, though. I have to recommend Sarah Monette's Doctrine of Labyrinths series, although the first two books are out of print I think you can get them on Kindle. It's a pretty dark series and Monette never lets any of her characters get the easy way out of anything but the protagonists Felix and Mildmay are such wonderfully realised, screwed up characters that it's still an absolute joy to read. I've heard of the series you mentioned, actually, though I haven't been able to pick them up yet. Thanks for the recommendation - if I get an e-reader, I'll pick up a copy. I agree about not letting characters get the easy way out - as soon as the characters stop feeling any consequences whatsoever (as has unfortunately happened in a few books I've read), it no longer deserves the term plot but 'wish fulfillment fantasy' instead. It's nice to see the opposite as well - ie. GRRM style. Hobb would have been at the top of my list - she's great with the first person view point and first person is a great way for a character to drive a story. I adore Robin Hobb's books. Was less impressed by The Rain Wilds Chronicles, but only because she sets the bar so high with The Farseer, Liveship Traders, and Tawny Man trilogies. So really, me being 'less impressed' just means that they were great - only not as great as her previous books. I would add Stephen King's Dark Tower series. Achingly well-written characters... Roland, Eddie, Jake and Susannah (and not forgetting Oy) are all fantastically realised. Have you read it? Memory, Sorrow, and Thorn was quite an early fantasy series, however: I find that it's a Tolkien-esque fantasy that really does work (aside from the ending, that I prefer to forget about). The biggest fault, however, is a -very- slow beginning, so I'd advise trying to read past first and seeing how you like it past his exit from the castle.